Local furniture store Martin & MacArthur has announced Michael Tam as its new chief executive officer. 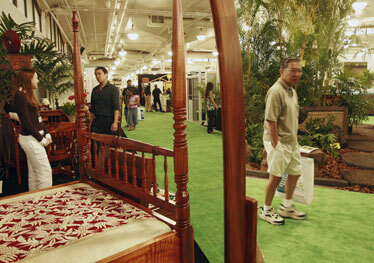 The longtime furniture store took part in last year's BIA Home & Remodeling Show at the Neil Blaisdell Center Exhibition Hall. Pictured are sales representatives Cameron Kadooka and Summer Patterson as exhibition goer Ernest Kumura walked past. Martin & MacArthur has named Michael Tam as its new chief executive officer. Tam is the first new CEO named at the fine wood furniture and retail company in more than 21 years. He succeeds former CEO Lloyd Jones, who is retiring. "We searched for the perfect leader to take the helm of Martin and MacArthur and found that in Michael," said founder Jon Martin. "He is a visionary and an innovator. Moreover, he understands the legacy and cultural foundation of Martin & MacArthur. Our leadership and heritage in the Hawaii market will be strengthened through his experience and insights." Tam, a graduate of St. Louis School and Northwestern University, brings extensive executive leadership experience from a range of companies, including Starbucks, Nordstrom, American Eagle Outfitters and McDonald's. Most recently, Tam served as senior vice president and chief marketing officer for Borders Bookstores. Martin added that he was grateful to have had Jones as a business partner for more than two decades, calling him a friend, and wishing him well in his retirement. Jones in 2007 was named Retailer of the Year by the Retail Merchants of Hawaii. Martin & Mac-Arthur was founded by Martin and Douglas MacArthur in 1961, with a mission of reviving the art of fine furniture in the classic style of Hawaii. Jones bought half of the business from MacArthur in 1986. Martin is still personally involved in selecting woods and crafting furniture at the showroom every day -- and he will continue in his role as president. The company's koa furniture have been featured in many homes, resorts and commercial businesses worldwide. Today, Martin & MacArthur has a showroom in Kalihi Kai, in addition to three retail stores that sell home furnishings, art and hand-crafted gift items at the Hyatt Regency Waikiki, Ala Moana Center and The Shops at Wailea. Former stores at the Aloha Tower Marketplace and Whalers Village were closed over the last three years. The business was previously made up of three divisions -- furniture manufacturing, retail stores, and picture-frame supplies. Yesterday, the company also announced that the division has been spun off into a new company called Hawaii Framing Supplies, which will continue to be owned and operated by Jones and Martin.